Thirteen new single-paragraph Embedded Exercises in Chapters 4 through 9. These excerpts are accompanied by open-ended, respond-in-writing exercises that provide immediate application of the skills presented in chapters 4 to 9. Six new 5-question Checkpoint assessments, one each in Chapters 4 through 9. Multiple-choice exercises check students’ understanding of the skills presented in each chapter. Because they target specific chapter skills, these easy to score activities provide additional practice and helpful feedback to both students and the instructor. Ten new 10-question Essential Skills Review Tests at the end of the book. Each of these multiple-choice tests encompasses the vocabulary skills presented in Chapter 2 and the comprehension and critical reading skills presented in Chapters 4 through 9. This recursive review and/or assessment of essential skills allow students to strengthen and refine their skills, as well as see their progress. Tests can be assigned as homework, supplemental work, or used as collaborative in-class activities. Six new 5-question Test Your Understanding comprehension exercises, one each in Chapters 4 through 9. These open-ended, respond-in-writing exercises target the skills presented in each chapter. Because these are open-ended, they simulate what students must do when they deal with actual textbooks. They also provide opportunities for students to become more precise in their writing. New Reading Skills Competency Chart. This comprehensive, color-coded chart is conveniently placed at the beginning of the text. It allows instructors to quickly locate specific reading, vocabulary, critical thinking skills, and study skills wherever they occur in the book. Specific competencies can be easily accessed for targeted instruction, review, and preparation for standardized or state-mandated tests. New Assignment Sheet and Progress Record. Located on the inside back cover, this score summary sheet allows students to record their scores and track their progress on the text’s assessment exercises, reading selections, and multiple-skills tests. Direct instruction and scaffolded approach with clear explanations and understandable examples. Recursive, integrated application of skills provides ample practice. Comprehensive coverage of reading for understanding, critical thinking, vocabulary, and study skills. Numerous textbook excerpts and longer passages for application of reading and study skills. Chapter Review Card activity following each chapter provides a structured review of the essential concepts presented. Test Your Understanding exercises in Chapters 4 through 10. These multiple-choice exercises provide immediate feedback on students’ understanding of chapter concepts. Students can check their comprehension immediately after completing the chapter and before starting the reading selections. Thorough treatment of authors’ writing patterns, including list pattern (division/classification), sequence/time order pattern (process), definition pattern (definition-example), comparison-contrast pattern (ideas in opposition)cause-effect pattern, and spatial order pattern (place order). Thorough treatment of other writing patterns. Many standardized tests, such as state-mandated ones and course exit tests, include patterns beyond the basic ones; the patterns now addressed are the addition pattern, the generalization and example pattern, the statement and clarification pattern, the summary pattern, and mixed pattern. Patterns beyond the basic ones are introduced in a separate section giving instructors flexibility as to whether they use them and to what extent. Awareness of writing patterns also enhances students’ own writing. Thorough treatment of relationships within and between sentences, including clarification, example, addition, sequence, comparison, contrast, cause-effect,problem-solution, spatial order, summary/conclusion and concession. Twenty-seven full-length reading selections (3 in each of the first nine chapters). Reading Selection Quizzes are included for the 27 reading selections in chapters 1 through 9. Annotation Practice Exercises and Respond-in-Writing Exercises that accompany each reading selection integrate writing and reading by calling for written responses and the formulation of the selection’s overall main idea. Respond in Writing Exercises include collaborative options. Thorough treatment of the SQ3R Study System and an enhanced section on the Three-Step Process for Reading and Studying Textbooks. SQ3R, a familiar, longstanding study system, is introduced in Chapter 3; this is followed by an in-depth presentation of an effective three-step process in Chapter 10. 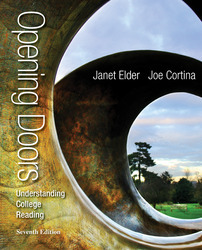 This comprehensive approach provides effective, step-by-step procedures for approaching college textbook reading assignments (Chapters 3 & 10) and preparing for tests (Chapter 11). Thorough treatment of Interpreting Graphs and Visual Aids in Chapter 10. Coverage of this topic is now more comprehensive and is especially important now that more people get news and information from the Internet and increasingly in graphic form. Younger college students in particular get their information in this form and need help in interpreting and evaluating it. A chapter-length Reading Selection (in chapter 10) with annotation, outlining, mapping and note-taking exercises. Coverage of all skills typically included on state-mandated reading competency tests, as well as Tips for Scoring Well on Standardized Reading Tests. Consistency in philosophy and approach with New Worlds and Exercise Your College Reading Skills, other reading improvement textbooks in the Elder/ Cortina series.